Afewerk Tekle (born 1932) is without doubt the father and leading figure of Ethiopian art over the past half century. He is famous for designing the stained glass windows depicting Africa’s past, present and future struggles and liberation, which grace Africa Hall in Addis Ababa. He has also won great acclaim for his sculptures, stamps and murals depicting Ethiopian culture and personalities. In Addis Ababa the religious art in St. George’s Cathedral is a striking example of his skill. His work is to be found in many venues from the national art museums to humble coffee houses. The artist’s own residence, Villa Alpha, is a beautiful museum in itself. Mother Ethiopia (1963) is certainly one of Afewerk Tekle's most striking and evocative paintings. 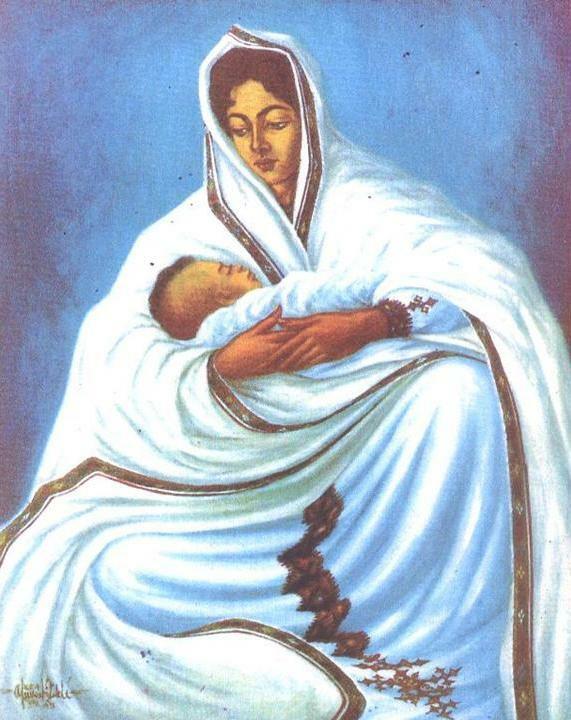 The artist has suggested that the mother is painted in the shape of the map of Ethiopia (prior to Eritrea’s secession in 1993). Symbolism in the painting may be described as follows: The ample folds and draping of the mother’s hand-woven cotton kemis or shemma are to represent the valleys, mountains and potential wealth of the country. Blue represents a peaceful era and the reflection of that peace is seen in the mother’s garment. A child, sleeping and unaware, symbolizes the future of the millions of Ethiopia’s citizens. Expressing care and love for her offspring, the mother cradles the child with gentle hands while she somehow seems to look beyond the baby to the future. Another well-known Ethiopian artist, the singer Tesfaye Gabbiso, has composed a prayer song which complements the spirit of Afewerk’s painting Mother Ethiopia in expressing the longings of the Ethiopian faithful for their country. Many of Tesfaye’s songs were of immense blessing, comfort and nurture to the church in Ethiopia during the years of revolution (1974-1991). The distinctive Amharic script is presented alongside the English translation below. Likewise you blessed his soul and enlarged his country. We, too, are your offspring. Gather and keep us. May our life be soaked, our soul satisfied. 5. Let us not be lonely. Multiply us by blessing us. Enrich us by your grace; make us grow by your Word. Afewerk Tekle: Mother Ethiopia, 1963. Lila Balisky served with SIM Int’l and the Ethiopia Kale Heywet Church with her husband Paul from 1967-2005. Interested in Ethiopian art and song, she published “Theology in Song: Ethiopia’s Tesfaye Gabbiso” (Missiology, October 1997). 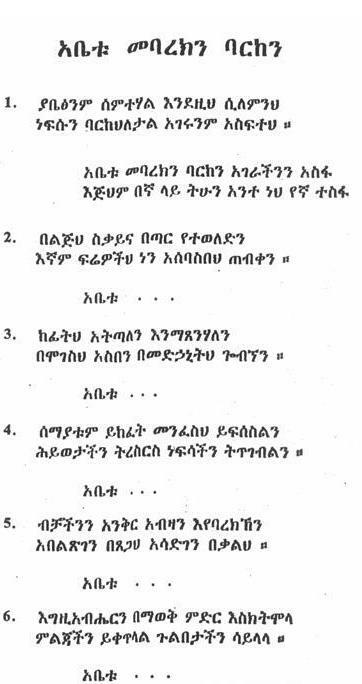 An Amharic/English diglot of 105 of Tesfaye’s songs is soon to be published in Addis Ababa. Lila has taught in the area of ethnomusicology at the Ethiopian Graduate School of Theology (EGST) in Addis Ababa and may be contacted at paulilab@telus.net.